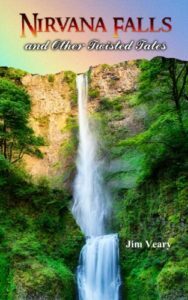 Grab your favorite beverage and get ready to enjoy this outstanding first book from Jim Veary, one of 2017’s most promising new authors. There is something for everyone in Nirvana Falls and Other Twisted Tales. His wide variety of short stories form a jungle of genres ranging from humor to science fiction and from suspense to horror. Veary creates captivating stories that feature eloquent writing, believable characters, and an articulate and witty style that keeps readers returning again and again. Featuring the title story, “Nirvana Falls” in addition to “Desperate Hero”, “Clowns”, and many others. This entry was posted in Jim Veary Books. Bookmark the permalink.